County: Fairfax County Cities: Annandale, Baileys Crossroads, Belle Haven, Burke, Bush Hill Woods, Centreville, Chantilly, Clifton, Cooktown, Dranesville, Dunn Loring, Fair Oaks, Fairfax Station, Floris, Fort Hunt, Franconia, Great Falls, Greenbriar, Groveton, Groveton Heights, Hayfield, Herndon, Herndon Heights, Huntington, Hybla Valley, Idylwood, Jermantown, Kings Park, Lake Barcroft, Laurel Hill, Lincolnia, Lorton, Mantua, McLean, Merrifield, Mount Vernon, Newington, North Springfield, Oakton, Pimmit Hills, Ravensworth, Reston, Rose Hill, Seven Corners, Springfield, Tysons Corner, Vienna, West Springfield, Wolf Trap, Woodburn, And Woodlawn. Fairfax County POOP 911 picks up what your dog leaves behind. All those Hound Mounds, land mines, poopie piles are no problem for POOP 911. We will come out to your house on a day of your choosing and go directly into your back yard to take care of the dirty work. We'll clean all the dog poop out of your yard and even deodorize it leaving a fresh clean scent if you like. If your dog poops it we will scoop it. Fairfax County POOP 911 is here to help and give you back valuable time you have to be doing other things. We offer weekly, bi-weekly visits and will build a custom schedule and plan to meet your households needs. We also offer hosing down of your deck or patio and deodorizing service so your yard smells as clean as before your favorite four legged furry friend came to live with you. Also we don’t bill in advance! We are the ONLY pooper scooper company that bills after each service visit is completed on that same day.If we aren’t able to scoop due to inclement weather you don’t get billed. It’s as simple as that! So call us at 1-877-POOP-911 today and come home to a clean green yard. We guarantee your satisfaction or your next scoop is on us absolutely FREE! County: City of RICHMOND Cities: Jackson Ward, Oliver Hill, Shockoe Bottom, Church Hill, The Fan, Oregon Hill County: HANOVER COUNTY. Cities: Ashland, Beaverdam, Cold Harbor, Doswell, Mangohick, Mechanicsville, Montpelier, Rockville and Studley County: HENRICO COUNTY. Richmond Poop 911 is a pet waste disposal service meant to provide you with a clean yard so you can fertilize it as you see fit….NOT what your dog sees is his sole duty….aside from eating of course!. Many times your dog’s poopie piles, dog logs, land mines, canine mines can build up faster than the earth cares to take them away. Let Richmond POOP 911 clean up after your dog and make your lawn a fun, clean and safe place to be. Richmond POOP 911 offers weekly, every-other week, once-a-month and one-time cleanings. Our services include but are not limited to: Poop Scooping, Odor Eliminator Spray, Lawn Disinfectant Spray. Gift certificates available! We also do commercial and special events. Call the poop cleanup specialists at 1-877-POOP-911! If we aren’t able to scoop due to inclement weather you don’t get billed. It’s as simple as that! So call us at 1-877-POOP-911 today and come home to a clean green yard. We guarantee your 100% satisfaction or your next scoop is on us absolutely FREE! Cities Serviced: Bristow, Catharpin, Dale City, Dalecity, Dumfries, Gainesville, Haymarket, Lake Ridge, Manassas, Manassas Park, MCB Quantico, Montclair, Nokesville, Occoquan, Prince William, Prince Wm, Quantico, Quantico Naval Hospital, Southbridge, Sudley Springs, Triangle, Wdbg, and Woodbridge, Virginia. Prince William County Manassas Woodbridge POOP 911 is here to take care of all of your dog poop scooping and pet waste clean up needs! No more dirty work for you and your family. Have kids? Worried about what they might be tracking in? Never fear POOP 911 Prince William County is here. If your dog poops it we will scoop it. POOP 911 Prince William Manassas Woodbridge Virginia is here to help and give you back valuable time you have to be doing other things. We offer weekly, bi-weekly visits and will build a custom schedule and plan to meet your households needs. The way DoodyCalls pet waste removal service works is pretty simple: A uniformed, friendly, and insured dog scooping technician will arrive at your residence, enter the backyard, pick up all the dog waste, and leave a door hanger on your door when the job is complete. There are no contracts, and you will never need to clean up after your canine companions again! Give us a try or learn more about why DoodyCalls residential & commercial pet waste removal services are the best! In addition to scooping residential yards, we actively work with HOA's, apartment communities, and parks to manage pet waste in common areas. We clean common areas and sell, install, maintain, and service pet waste stations from start to finish. We also stock/sell pet waste station supplies and dog waste bags. Give us a try or learn more about our community pet waste management services. We understand that we must all work together to keep our environment clean and we are active members of the Chesepeake Bay Foundation. We truly are experts at what we “doo.” with doo. It's our life here at DoodyCalls. We have a 100% satisfaction guarantee, we believe in keeping our customers happy and we greatly appreciate your business. Pro dog pooper-scooper services for Norfolk, Virginia Beach, Hampton Roads, and Chesepeake, Virginia. We've been keeping Virginia clean since 2000! DoodyCalls is Fully Insured and is completely prepared to take on your dog waste removal needs - no matter how many dogs you have. They offer dog poop pickup relief for both residential homes with dogs as well as commercial property scooping. Pet friendly apartments, dog kennels, Home Owner Associations, and condos are a few of the types of multi -plex units we have proudly supported over the years. Property managers enjoy the cleaner properties and so do prospective renters and home buyers. Professional level pet waste cleanup and removal for Alexandria, Kingstowne, Lorton, and Springfield, Virginia. Simply put, we collect all the pet waste from your yard, and dispose of it safely. We keep to a regular schedule, so you know when to expect to us. We use our own tools and equipment which are disinfected at each site. Your family is left with a safe and clean space to enjoy. We work year-round, and in almost any weather! Pet Domestic is a service-first pet waste removal business, operating only in the DC metro area. We are not a nation-wide franchise. Being local means being better able to serve you and the community. You already deal with enough call centers; shouldn't a company that serves your home just pick up the phone? At Pet Domestic we do! Questions and comments are directly handled by the owner-operator. Your satisfaction is our #1 priority and we actively seek your feedback! We keep our prices fair by relying on word-of-mouth advertising rather than expensive ad campaigns! We gladly match prices with competitors, because we know we can do the job better than anyone. 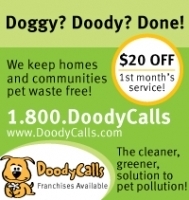 Doodycalls is a dog waste removal service that operates professionally in and around Stafford County, Spotsylvania County, and King George County, VA. We support the needs of pet owners in the following areas of Virginia State: Aquia Fredericksburg Garrisonville Sumerduck Chancellorville Massaponax Shady Grove Widewater Five Mile Fork and Hartwood, VA.
We've been keeping Virginia clean since 2000! DoodyCalls is Fully Insured and is completely prepared to take on your dog waste removal needs - no matter how many dogs you have. We offer dog poop pickup relief for both residential homes with dogs as well as commercial property scooping, and service and installation of pet waste stations. A uniformed, friendly, and insured dog scooping technician will arrive at your residence, enter the backyard, pick up all the dog waste, and leave a door hanger on your door when the job is complete. There are no contracts, and you will never need to clean up after your canine companions again! Pet friendly apartments, dog kennels, Home Owner Associations, Pet Friendly Hotels, and condos are a few of the types of multi -plex units we have proudly supported pet owners in over the years. Property managers enjoy the cleaner properties (free of unsightly dog poop) and so do prospective renters and home buyers. We've got the scoop on your dog's poop." 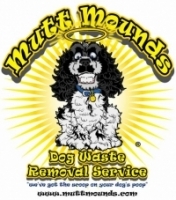 Mutt Mounds Professional Dog Waste Removal Services supports residential and commercial needs in the cities of: Remington Bealton Culpeper Warrenton Opal Fredericksburg Orange Rixeyville New Baltimore and Stafford, VA. At Mutt Mounds, your satisfaction is guaranteed. If you are not satisfied with our service, we will make it right, or you don't pay. That's the bottom line. Drop by the website to get an idea of our dog pooper scooper pricing schedule and booking availability in your area. We service the Central/Northern Virginia area. Check out our site and services, and start enjoying a poop free lawn today! We are a professional service, and are licensed, insured and reliable. We are a proud member of the Association of Professional Animal Waste Specialitst, and we adhere to their strict code of ethics. Just Imagine...Never Scooping Poop Again! Wouldn't you rather be doing something else? Hello, my name is Paul Richardson owner of PoopBrigade. We are professional dog poop eliminators. Turning piles into smiles is what drives us daily. We have fun but take our jobs seriously. Making life more convenient, enjoyable, and healthier for pets and their owners is our mission. Let's face it cleaning up after your pet isn't glamorous but it needs to be done. PoopBrigade will help keep dog feces off shoes, pet's paws, and out of your home. Regular scooping will keep your lawn looking nice. Dog poop can literally ruin a lawn: This occurs all too frequently. Moreover, pet waste also poses a serious health hazard. Parasitic infections can make humans extremely sick. Why not hire a Richmond-based company that specializes in removing pet waste so the kids or you can roam freely? Our services are 100% guaranteed and a portion of net proceeds goes to SPCA. Your satisfaction is our #1 priority. That's not just a statement. It's our policy. Three words to remember: Trustworthy, Dependable, and Consistent. We clean you relax. Dog Poop Gone! 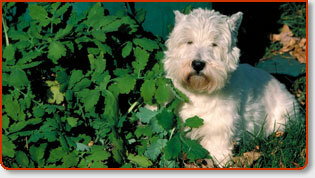 Dogs Doo It is Lynchburg, Virginia´s number one pet services company. Dogs Doo It offers professional at home pet sitting, dog walking, pet transportation and canine waste services in Lynchburg, Virginia. Dogs Doo It's professionals and dog walkers in VA are insured as they provide you with pet services, pet sitting, dog walking, transportation and canine waste removal. This is not a â€œside-lineâ€� or part-time business; Dogs Doo It is dedicated to providing Lynchburg, Virginia and the surrounding communities with professional pet services, whether pet sitting, dog walking, or canine waste removal seven days a week. Poop Rescues, LLC Is A New Pet Waste Removal Business Servicing Northern Virginia. * Poop Rescues is a Professional Pet Waste Removal Service which will make your life easier with complete cleanup and removal of canine waste from yards and dog runs. 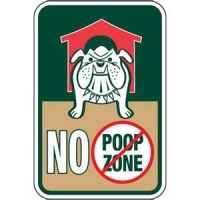 * Poop Rescues eliminates the most unpleasant aspects of dog ownership! * Rates as low as $10.00 a visit. We offer, 1X week, 2X week, and every other week service. There are no contracts to sign and we donate 10% of all your payments to the ASPCA® or the Rescue League or Shelter of your choice. * Poop Rescues GUARANTEES reliable, responsible service. We find, scoop and haul away all those nasty "canine calling cards" that ruin your yard and mess up your free time. We can be reached to schedule a free estimate or make dog waste cleaning appointment by calling 703 880 5214. “Pooper scooper?” I can hear you thinking out loud to yourself wondering, “what in the world am I going to do with a pooper scooper service?” As one dog owner to another, I’ve got a couple questions for you all of which are related to obtaining the professional services of a licensed and insured Virginia pooper scooper. Have dog poop problems been hounding you lately? Do you consider “quality” time between you and your dogs as walking around the backyard picking up their dog poop while they tag along sniffing your heels? Wouldn’t you appreciate it more if you could spend more time *playing* with your dogs as opposed to *picking* up after them? I’ll let you in on a little secret. You don’t have to play weekend pooper scooper at your home anymore. If you have dog poop problems, well let’s just say these guys who call themselves pooper scoopers definetly want your dog poop. You got it. They’ll take your crap. You’ll be freed up to do more of the things you like and your dogs will be smiling from ear to ear over their cleaner dog pen. Doesn’t matter if you own a home with dogs or are the property manager of a large apartment complex with pups. Your dog poop production problems will be “removed” regardless. Solved. As a pet owner, you can eliminate this filthy chore by utilizing one of the affordable and professional, Virginia dog waste pickup and removal services listed for free here. If you’ve never considered this service, I think you will be quite surprised and impressed just how smooth and well taken care of your dogs “unmentionables” will be after signing up for this unique pet service. Consider this pooper scooper service also for any of your relatives or friends that are physically or mentally impaired and simply struggle to keep up with maintaining a pleasant yard for their dogs and family. This unique service really makes for a fitting gift to a dog owner as well as others who no longer can or want to pick up after their dogs. To say this is becoming a popular service around the country would be an understatement.